We believe that it is important that people who are involved in the life of our Church are kept informed about what is happening within our Church community. 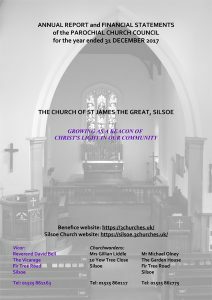 Each year Silsoe PCC publishes an Annual Report and Financial Statements which reviews the life of the Church in the period. However, printing copies uses a lot of paper, toner ink, etc. and being mindful of the environment, we publish a copy on our website, together with a pdf copy which can be downloaded. Please follow this link to see our latest Annual Report. Periodically we may also publish newsletters with information about Church related activities. If you would like to receive our newsletters and/or be advised when a new Annual Report is published, please click on the button below to join our Keeping You Informed mailing list.